We had a hard time waking up today but were determined to be up and moving before the mosquitoes ate us alive. We rallied and were on the trail before 6:30am. Four tenths of a mile up the trail we celebrated our 1,000 mile mark. We can hardly believe we’ve walked this far. 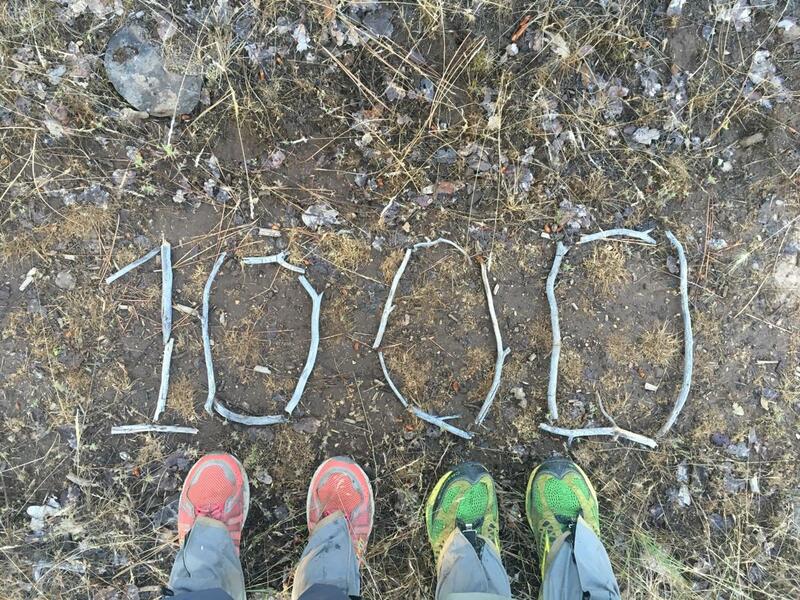 It’s rewarding to know we can walk this many miles and feel as good as we do. We hope our feet, bodies and minds continue to serve us well over the next 1,650 miles. We walked fast, making miles quickly in the cool morning air. At a sort of high point near power lines we had reception so we took a break, made calls, answered emails, uncussessfully attempted to upload blog posts and moved on. A few miles later, after crossing a series of dirt roads we came upon the Wild Bird Cache. Coolers full of soda, water, red vines, cheese puffs and pretzels were generously left by a family for hikers to enjoy. Laurie finally got the fizzy, sugary drink she was craving yesterday. It wasn’t as rewarding since it was morning and still cool but she enjoyed a root beer nonetheless. The table had boards nailed onto it, encouraging hikers to use sharpies to sign their names and a message if they so desired. We appreciated the surprise and creativity of this cache. Thank you to those who maintain it! We walked less than about hour and ran into Laurie’s mom headed toward us. She found us again. Yay! We walked the 3.5 miles to Burney Falls State Park together. It was beautiful! Millions of gallons of water cascading down two main waterfalls and at least a dozen others careening over weeping rocks covered in lichen. The lush forest surrounding the falls added to the beauty. We then headed to the general store where Andy picked up our packages and Sue bought coconut popsicles for Laurie and herself. The store wanted to charge us $16 for holding two packages. We were expecting to pay only $5 per box and were quite irritated. We told them that online it says the fee for holding packages is $5 per box, at which point the young lady behind the register looked in her log book and lowered the price to $11 for both boxes. Very shady. Andy had chosen to send our resupply boxes to businesses and motels so we don’t get stuck in towns when the Post Offices are closed, but many businesses have increased their package pick up fees. A lot of them just before the hiking season started. 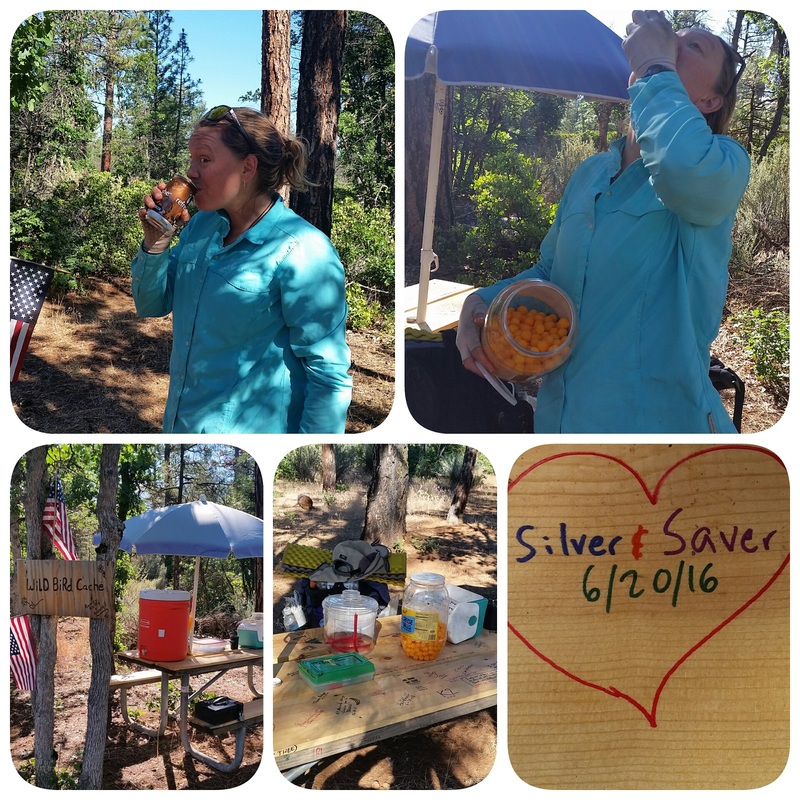 It was almost noon and we needed to charge our electronics, get food, shower, do laundry and post our blogs. Andy stayed at the store charging everything while Laurie and her mom hiked one mile back to Highway 89 to get the rv. When they returned we headed for the showers. We hadn’t showered in 7 days! But before we could go to the showers Sue insisted we go to the dump station to fill up her water tank. It was hot, we were hungry and this was one more thing to do. Once the tank was full we all got in the rv. Andy was holding into the frame of the rv while getting in when Laurie shut the front passenger door on his fingers. Andy’s ring finger was bleeding and his index and ring fingers hurt too, but nothing seemed broken. Andy rushed back to the filling station, turned on the water and rinsed his bloody finger while Laurie grabbed a band aid. Andy will be ok. He won’t lose any of his nails. Finally we were on our way to the showers. We divided the quarters we had between the three of us and went to get clean. Laurie had never used a coin operated shower before and it had been at least 7 years since Andy used one. Laurie and Sue seemed to be enjoying themselves but Andy was not. The machine had returned one of his quarters. But it was too late when he noticed this had happened. The water turned off just as he put in the quarter. Rats! He put in another quarter to get at least two more minutes of blissful hot water but nothing. He was out of quarters with his upper body still covered in soap. When Laurie was done she came to check on Andy and offered him three quarters. Thank you Laurie! Andy put the quarters in the machine. No water. Frustrated, he called for Laurie while punching the machine. After punching the machine a second time it returned his quarters. He quickly grabbed his things and moved to the other shower. He put in the quarters and he had water again. But it was really cold and he waited what felt like a minute for the water to warm up. The race against the clock isn’t a game Andy enjoys. He knew he had enough time to rinse himself off but it was still frustrating. When he got back to the rv it was 2pm. We got to the laundromat in the town of Burney around 2:30pm, put in a load and headed for the Safeway for lunch. We bought two roast chickens, a dozen eggs, hummus, carrots, kimchee, salad greens, grapes, cottage cheese, nectarines and four avocados. We took the grocery bags to the rv while Sue went back in to buy more fruit. We felt uneasy with our clothes sitting in the washing machine but Sue insisted we get gas first. She asked Laurie to clean the windshield which took additional time. Finally around 3:45 we returned to the laundromat, put our clothes in the dryer and went in search of a place to eat. Needless to say, we were all hangry and irritated by this point. None of us had eaten or drank much since 10am. We were all on edge. After lunch, we drove to a potential campground but it was closed. 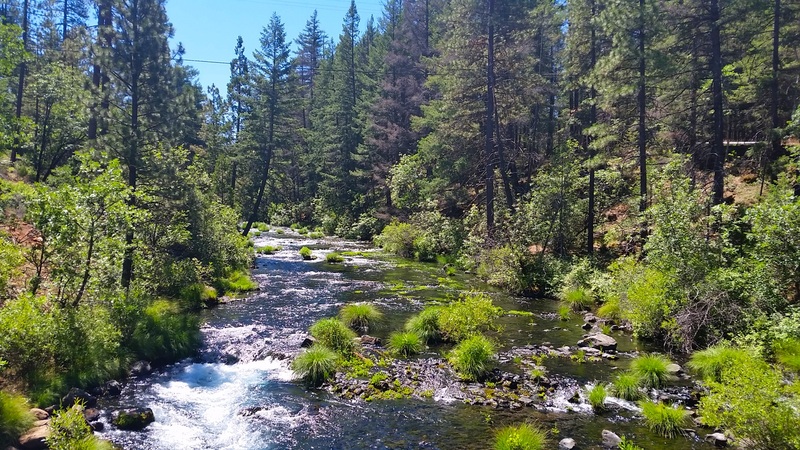 We drove back to Burney Falls State Park in hopes of camping there but they were full, so we dropped off Andy so he can charge the electronics while Laurie and Sue went in search of home for the night. It’s been a long day. Our town stop was a luxury and became more of a headache than it was worth. We go into “go” mode when we get into town and it is hard to make time for tasks other than our own. Sue was a good sport and we tremendously appreciate her driving us around. We will plan the next visit where there are less distractions so it is more pleasant for everyone. 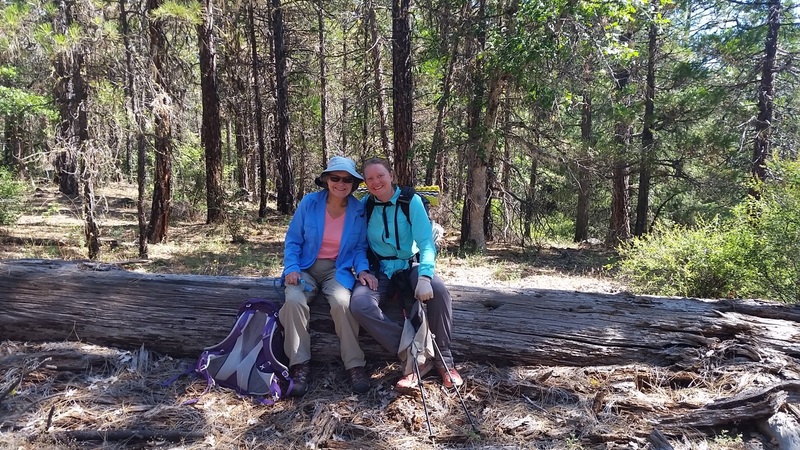 Laurie and Sue returned to pick up Andy after having secured a spot at Dusty Campground just outside Burney Falls. We ate dinner in the park before heading to our campsite on the shore of Lake Britton. It was pretty but buggy. We were all tired and ready for bed. Laurie hung out with her mama while Andy relaxed in the tent. It’s now 10pm and we are finally in our sleeping bags. What a day! We are ready to get back on the trail. But first we sleep. Tonight we are grateful for grapes and available campsites. Burney Falls is breathtaking. I had to look it up to see exactly how far it was from the bay area. Who would have thought something so exquisite is so close to us (still a 4+ hour drive but I shouldn’t be complaining when you two are trekking for many more hours daily). 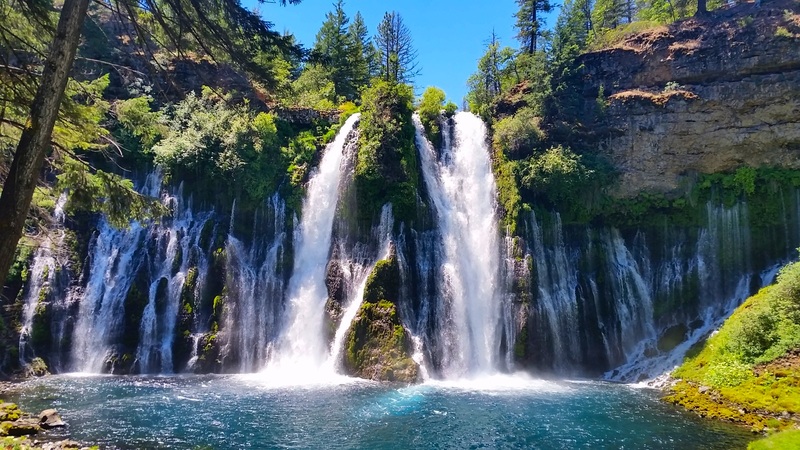 Burney Falls is wonderful. A must see, especially if you live in the Bay Area!